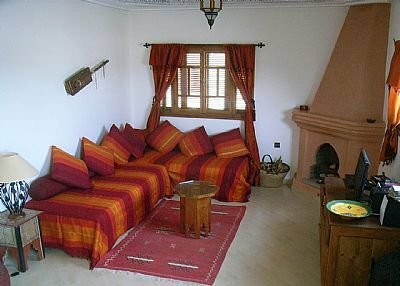 Mirador Maroc is a spacious, modern apartment for six people in the delightful Moroccan coastal town of Essaouira. Its location at the southern edge of the town is ideal for the part of the magnificent beach where watersports, beach cafes, camel and horse riding are centred. It is an easy walk beside the beach to the romantic fortified Medina with its charming shopping streets, colourful souks, cafes and restaurants. It is also close to a newly developing area of hotels, villas, shops and golf courses a short distance to the south of Essaouira. The apartment is in the Erraounak District of Essaouira, which is gradually being expanded with the addition of new hotels, cafes and shops. The apartment and its lovely rooftop terrace are a tranquil haven within this growing quarter. Mirador Maroc is one of five apartments in a building constructed in 2005. We occupy the third floor and a huge private roof terrace with amazing views over the town, the beach and its offshore islands, and the surrounding woodland. The apartment is large – 73 m2 of interior rooms plus a lower terrace of 14 m2 and the roof terrace of 64 m2 . Built to a high standard, it is floored throughout (indoors and out) with polished tiles, and decorated with local fabrics and artefacts. Several rooms have elaborately carved plaster ceilings. The apartment can comfortably accommodate six people, in one double bedroom, one twin bedroom and sofas with full bed mattresses in the living room that convert readily into two single beds. The apartment has reliable supplies of mains water and electricity. Hot water is provided by an electric heater and cooking by bottled gas, which our manager will arrange to replenish as necessary. The living room has an open fire which will burn logs or charcoal, though very rarely needed. For occasions when you do not want the trouble of lighting a fire, we have electric heaters. There is a hair-drier in each bedroom, and a CD player with MP3 connection. The apartment does not have a phone line, but we provide a mobile phone with a Moroccan account, which is very cheap for local calls. Access to the building is via a shared front door (with an intercom to the apartment) and a tiled staircase. Living room (34 m2) – a large open plan area that includes a hallway, a dining area where a mosaic table seats up to eight, and a sitting area with two sofas and a fireplace. This room opens through double doors to the lower terrace, which is enclosed by white walls with a wooden staircase rising to the roof terrace. This space is useful for drying clothes, and is also a lovely quiet spot for breakfast at a small mosaic table and chairs, well sheltered from the wind but catching the sun for much of the day. Bedroom 1 (12 m2) – containing a double bed, bedside tables, a wardrobe and dressing table. Bathroom (5 m2) – part tiles, part plastered in the traditional ‘tadelakt’ style, the room has a bath with shower attachment, WC, bidet and wash basin. Kitchen (8 m2) – contains a sink fitted in a tiled work surface a range of cupboards equipped with crockery, classes, pans and cooking utensils fridge gas cooker and an electric heater for hot water. Roof terrace (64 m2) - reached by stairs from the lower terrace, this huge space is floored with polished tiles, and is a sun trap at all times of day. There is a Barbecue area, and a seating area roofed by wooden trellis where you can enjoy shelter from the sun and wind. This terrace is furnished with a variety of sun-loungers, chairs and cushions than can be dispersed wherever you want to make the most of the sunshine and views. Wall lights and power are fitted, so the terrace is as good for eating and partying after dark as it is for relaxing during the day. Essaouira offers a wealth of things to do. The town is built on a stunning beach that extends for many miles along the coast, and is well set up for watersports, including surfing, kite-boarding, and wind-surfing as well as walking and sun-bathing. The beach promenade is lined with cafes and restaurants. There are opportunities for horse-riding, camel-riding and quad-biking, as well as boat-trips to the offshore islands, and golf at a Gary Player designed course in the neighbouring woodland. The Medina is absolutely full of opportunities to shop, eat and soak up local colour. Dozens of restaurants offer every type of dining, from outdoor fish stalls by the harbour, to pizzas, traditional Moroccan dishes, and fine international cuisine. There are many chances to enjoy local musicians, while dining or at several night-spots. There are several small local shops in the streets surrounding the apartment, where you can buy bread, milk and a few other things. More extensive food-shopping is available at two mini markets on Place 11 Janvier, about ten minutes walk. That square is also home to an excellent French-style cafe + delicatessen. There is a large, modern air-conditioned Carrefour Supermarket only 300 m from the apartment building. It has a wide range of food, including fresh meat, fruit and vegetables, bread as well as selling alcohol, packaged food and household goods. The Medina is full of small shops selling every kind of goods, including a rich variety of crafts that make excellent souvenirs of Essaouira. Transport around the town is easy, using the small blue ‘Petit Taxis’ which charge a very modest standard fare to go anywhere within the town, or enjoying the walk along the promenade. There are also horse-drawn carriages (‘caleches’) always available on the main town roads. Larger taxis or car hire are available for trips farther afield. Essaouira enjoys a wonderful climate, buffered by its proximity to the sea. Therefore it never gets uncomfortably hot at the height of the summer, and remains warm throughout the winter. Average temperatures vary from 20 C to 27 C and Essaouria is sunny for well over 300 days a year. The wind is a feature of the area sometimes it blows strongly (which delights the watersports community) and is rarely absent, though often providing a pleasant balance to the heat of the sun. Rainfall is very low, with a monthly average of only 28 mm, most of which falls between November and February.